Happy birthday David Greenberg (A Tugging String, Don’t Forget Your Etiquette, Enchanted Lions). The infamous Nero becomes emperor of Rome in 54 A.D. Read Nero Corleone by Elke Heidenreich, illustrated by Quint Buchholz. In 1307 hundreds of Knights Templar in France are arrested by agents of King Phillip the Fair. It may have also been the birth date of Jaques de Molay (1244-1314), the last Grand Master of the Knights Templar. Read A Templar’s Apprentice: The Book of Tormod by Kat Black. The Whirlpool Galaxy, one of the most famous galaxies and easily observable by even amateur stargazers, is discovered in 1773 by French astronomer Charles Messier. Read Galaxies by Seymour Simon, NightWatch: A Practical Guide to Viewing the Universe by Terence Dickinson, and Henry and Mudge and the Starry Night by Cynthia Rylant. Tomorrow marks the publication of the fourth installment of Ann M. Martin and Laura Godwin’s The Doll People series, The Doll People Set Sail. Since, for some inexplicable reason, I have not talked about the original book, published in 2000, on the Almanac, today seemed appropriate to sing its praises. Many consider The Doll People a contemporary classic. The book combines the talents of three extraordinary people. Ann M. Martin has demonstrated not only her ability to craft commercial books like The Babysitters Club, but has also gone on to create beautifully written, literary works such as A Corner of the Universe. Brian Selznick, who early in his career designed spellbinding jackets and interior art, would eventually produce the groundbreaking and audacious novel, The Invention of Hugo Cabret. And Laura Godwin, as those in the children’s book industry know, is an editor’s editor—someone with amazing ability to help talented people shape books. 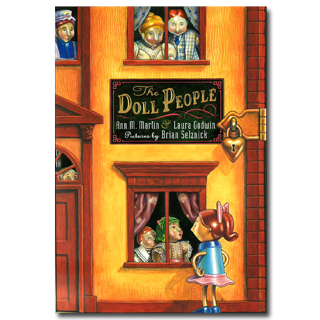 Nonetheless, I must begin a review of The Doll People with a confession: I hated dolls as a child and have never warmed to the genre of doll books as a critic. Give me a book about dogs or stuffed animals, and I am an ideal reader. Dolls: not so. Hence the fact that I love The Doll People and find myself enchanted with it every time I pick it up speaks volumes about this work. These three highly innovative people have won over a cynic when it comes to doll books. The Doll People tells the story of a group of china dolls who have been living in their dollhouse for more than a hundred years. Annabell Doll, perpetually eight, longs for something more—to escape her confined realm. Then, with the arrival of a new doll set, the brazen and plastic Funcrafts, Annabell begins to have the most exciting experience of her long lifetime. She solves the mystery of her missing aunt Sara, and takes great risks to bring her family back together again. The authors delight in revealing the threats to dolls’ lives to the readers—an evil cat, the actions of humans, their need to go into Doll State, deep freeze. Excitement, danger, adventure, and family dynamics, all appropriate for the eight- to eleven-year-old reader, can be found in these pages. Children often think about the secret lives of their pets and their toys. What happens when a child is away from these beloved members of their household? The Doll People plays on this fascination and sweeps readers along in a satisfying, heartwarming story. If you or the children in your lives love doll books, don’t hesitate to pick up this very handsomely produced paperback. Even if you have reservations about the doll kingdom, you might still want to sample a chapter of The Doll People and find yourself carried along by three brilliant creators. “Three weeks later, the doll maker had completed Nanny. That evening, it was Annabelle who had given Nanny the oath, something she did not let Nanny forget, even though Nanny, as a Nanny, was the one who now had to remind Annabelle to live by the Doll Code of honor. Annabelle knew she would always be a kid, and Nanny would always be a grown-up. And if somebody had to be a grown-up, Annabelle was glad she wasn’t the one. Originally posted October 13, 2014. Updated for . I read the first book, now feel compelled to read the next three! Thank you! I am excited about this 4th book. 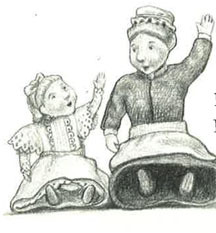 Hearing about it’s imminent publications, I decided that “The Doll People” will be the next read aloud in my 4th grade class. I’d been looking for a good read aloud with a female main character that the boys would like. This is the perfect choice. Well how did I miss this the first time around. I’m on the lookout for it now, and thank you Lady Anita.